One of the fun things about science is they do stuff just because they want to see if they can. It doesn’t have to make sense or be fuel-efficient or conform to any normal person’s sense of economy, they just have to ask the question, “Hey, do you think we could run a car on coffee?” and then some scientist will go out and do it. 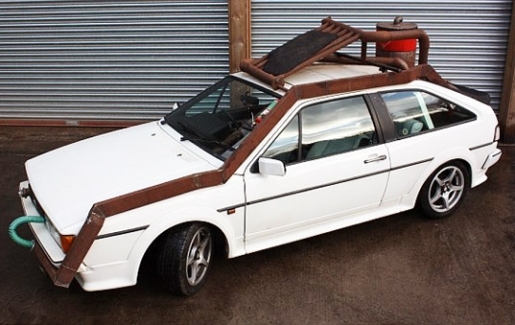 That’s the question behind the Carpuccino, a retrofitted 1988 Volkswagen Scirocco that has been outfitted to run on coffee grounds by BBC science show Bang Goes The Theory. The car gets about a mile of travel for every 56 espressos, or roughly three miles per kilo of coffee grounds. That makes it about 25-50 times more expensive than gasoline to power, depending on the price of gas and the type of coffee. That said, it wasn’t looking to replace gas, the Carpuccino exists only to answer a question. As it turns out, you can power a car on coffee. Coffee can do just about anything from make you look younger to replace gas, which is why it’s so good for you.